Enjoy the best inspirational, motivational, positive, funny and famous quotes by Adam Gollner. Use words and picture quotations to push forward and inspire you keep going in life! If manufacturers are so sure there is nothing wrong with genetically modified foods, pesticides and cloned meats, they should have no problems labeling them as such. After all, cancer will kill one in every two men and one in every three women now alive, reports Samuel Epstein, chairman of the Cancer Prevention Coalition. Like our ancestors, we act in ways that will bemuse future societies. 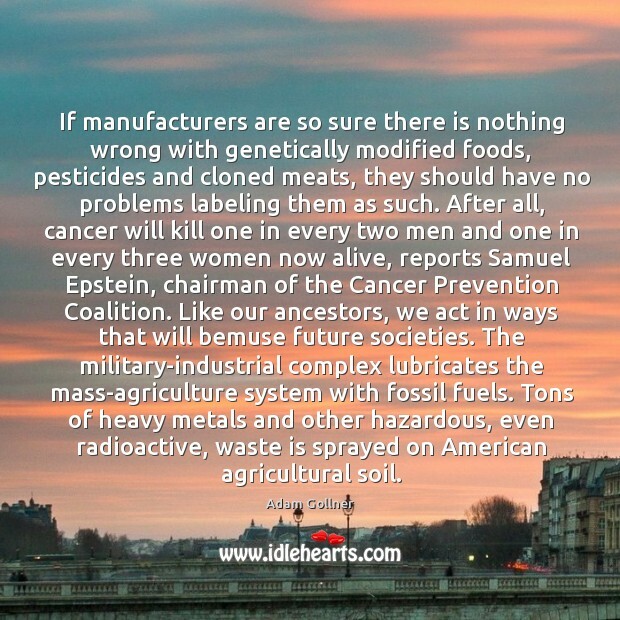 The military-industrial complex lubricates the mass-agriculture system with fossil fuels. Tons of heavy metals and other hazardous, even radioactive, waste is sprayed on American agricultural soil.